The warm months of summer are drawing to a close, and before we know it the leaves will be falling and snow will be flying. This is a perfect time to make sure you have adequate shelter for your horses. 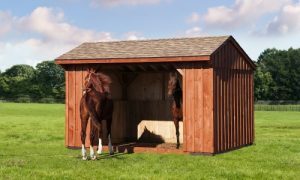 At Amish Barn Co, we offer horse barns and run-in sheds in a variety of configurations to suit the needs of each of our customers. Check out a few of our most popular options below! Thanks to their hinged overhang design, our lean-to barns can be delivered right to your property as a complete unit. Once the barn arrives, we simply raise the overhang and brace it with posts. This feature allows us to deliver complete lean-to barns up to 12’ X 28’ with no need for additional construction. These barns are available in the same dimensions as our lean-to barns, but without the hinged overhang. Constructed from durable, rugged materials, stall barns offer complete protection from the elements. They also come equipped with interior window grills to prevent accidental damage from animals. When your animals need to make a quick escape from the rain and snow, there’s no better place to go than a run-in shed. These structures are built with attractive kiln-dried white pine siding that can either be stained or left to weather naturally. They also include 4’ high interior oak kick-boards to protect them from regular wear and tear. When you need an especially large barn that’s customized to your specifications, modular horse barns are typically your best option. These barns are available with a number of optional features including sliding windows with grills, cupolas and weather vanes. They also offer several flexible stall layout options. You can browse the barns we currently have in stock online, or give us a call to learn more about any of the handcrafted structures we can build for you today!